Dragon Ball Super is the latest iteration of the hit Dragon Ball anime series. 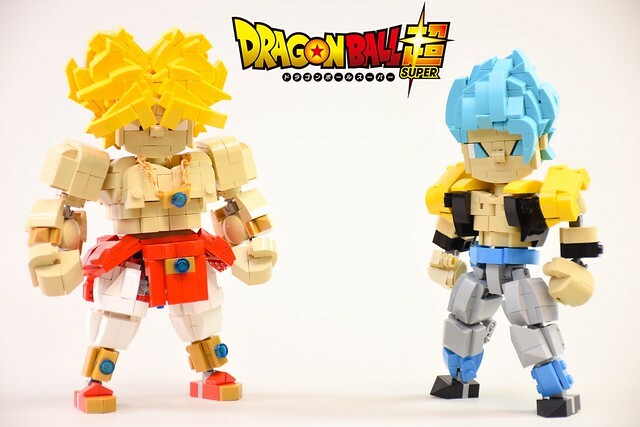 Builder Chak hei Mok has built LEGO versions of Broly and Gogeta, two iconic characters from the show. Slopes are extensively used to form each character’s muscles and spiky hair. Meanwhile, ball and socket joints allow for believable poses, and the eyes are packed full of attitude. 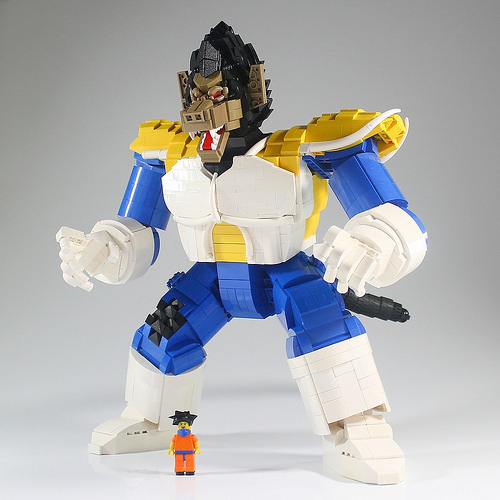 While the piece count for this Dragon Ball Z creation by Moko might not numerically match Vegeta’s most famous quote, our enthusiasm level for this LEGO rendition of his Great Ape form certainly does. 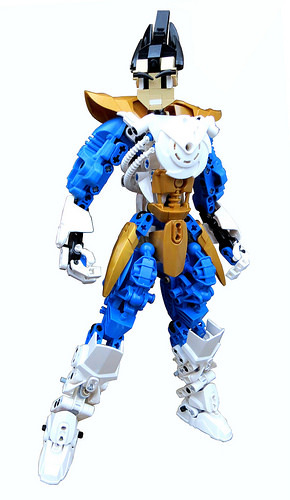 The face is a knockout, with a great use of minifigure arms to define the eyes and a strategic use of anti-studs to add texture to the ears and nostrils. The rest of the model is full of subtly impressive techniques, like the dinosaur tails to add definition to the shoulder’s edges, the tail made out of tires, and the inverted and slightly angled pectorals. Be sure to visit Moko’s blog for additional photos of this phenomenal creation. 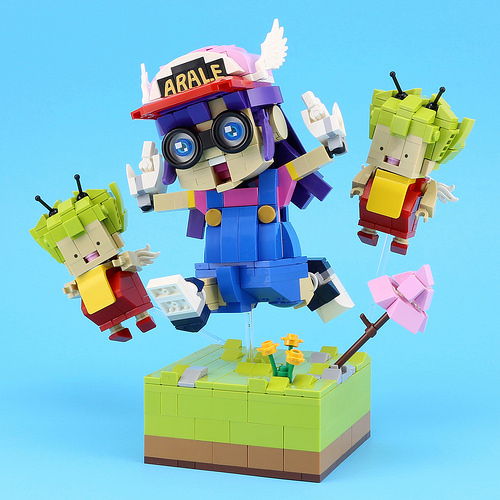 Arale Norimaki is a fictional character from the Dr. Slump manga series, created by Akira Toriyama. 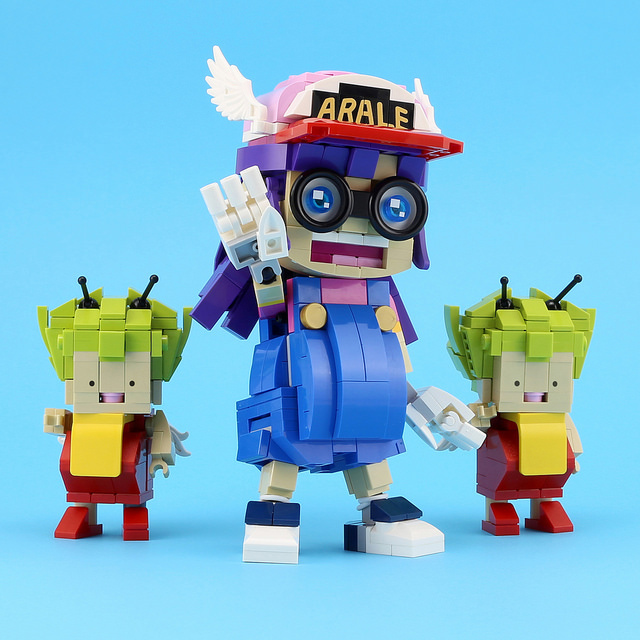 Arale is a robot girl who is strong, energetic and a bit naive. 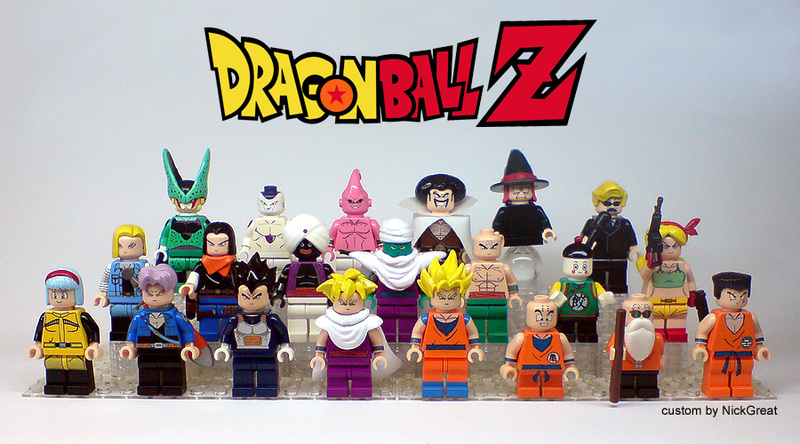 This playful model by LEGO 7 — which also features two Gatchan, or Gajira Norimaki — is a wonderful tribute to these unique characters, who make an occasional appearance on the popular anime Dragon Ball from the same creator. One of my favorite details is the use of a white rubber band wrapped around Arale’s ankles as a rumpled sock. The simple construction of her gloved hands, made from only 6 parts each is another nice touch. On the Gatchan, an inverted yellow chair forms a bib for this critter who is known to eat just about anything. 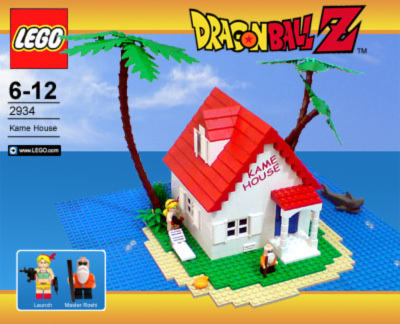 LEGO 7 has tweaked the model just a bit to give us a very dynamic and especially playful scene. 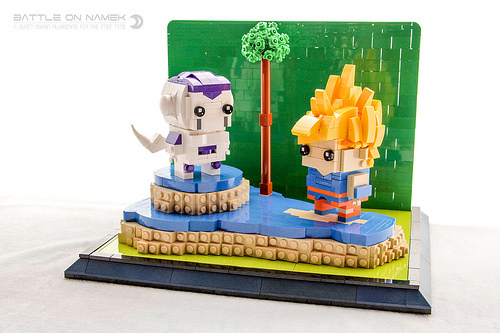 Given the popularity of the manga and animated series, it’s surprising how few LEGO creations we see inspired by Dragonball Z. David Liu corrects this oversight with an adorable pair of custom BrickHeadz featuring Goku in his “Super Saiyan” form battling Frieza in his “100% Full Power” form on the planet Namek. Goku’s spiky golden hair is perfect, and the inverted purple cheese slopes add exactly the right detail to make the evil Frieza instantly recognizable. With fellow animated show Adventure Time becoming a retail set soon, it seems a shame that the famous Dragon Ball series will probably never see an official set (perhaps thanks to a few scenes involving a blue-haired character and her underwear). Regardless, the beauty of being a LEGO fan is being able to make what the company won’t, and today Logey Bear did that with the Saiyan prince Vegeta. While this is a remix of the builder’s previous model, the addition of the warm gold armour pieces to make up the well-known Saiyan armour, as well as a brick-built head (distinct “M” pattern hairline included) and there’s no mistaking who this is. Q: Is this set for sale? A: This is not an official set from LEGO, and no, it’s not for sale.